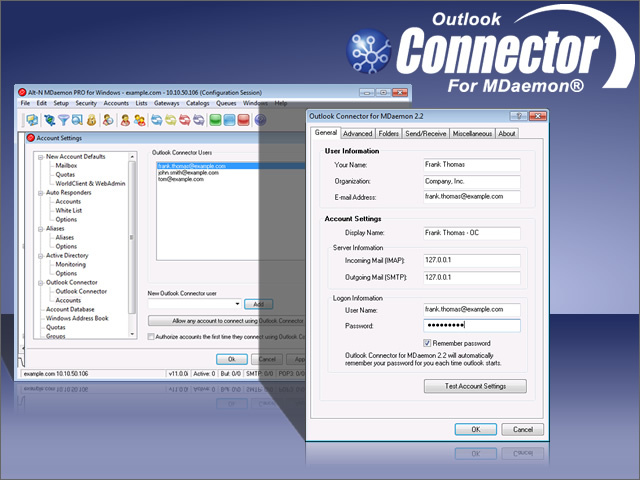 outlook connector, MDaemon, Microsoft Outlook, mail server, groupware, outlook, calendar sharing, calendar, task, contact, notes, journal, groupware software Connect MDaemon mail server to Outlook. Share calendar, contacts, and more. Outlook Connector for MDaemon opens up the groupware collaboration functions of Microsoft Outlook to small and mid-sized businesses by using MDaemon Email Server as the mail messaging server. With Outlook Connector for MDaemon you can stay in touch with employees, co-workers, customers, and vendors by sharing Outlook's email, calendar with free/busy scheduling, address book, distribution lists, tasks, notes and more. As with MDaemon, Outlook Connector is designed for businesses with little or no professional computer support. Its simplicity, economy and extensive features make Outlook Connector for MDaemon the recognized way to use Outlook's groupware collaboration tools on a small to mid-sized business budget. Alt-N Technologies' MDaemon email server provides outstanding groupware and collaboration functionality when paired with Outlook Connector. It makes professional-quality groupware collaboration features available to budget-minded small- to medium-sized businesses with or without IT personnel. The shared information is also available for on-the-go users through the groupware collaboration features of WorldClient, MDaemon's webmail application. The purchase of Outlook Connector includes one year of free upgrade protection to safeguard your investment. Outlook Connector for MDaemon version 2.2.4 is a minor update that adds support for attachments in Tasks (binary files and embedded messages), along with some additional fixes. Please review the Release Notes at http://files.altn.com/MDaemon/Release/relnotes_en.txt for a full listing.